Old-School Glamour: YSL and Polaroid! A little taster of a video that’s going to be winging its way to you quite soon – it’s all about old-school glamour! 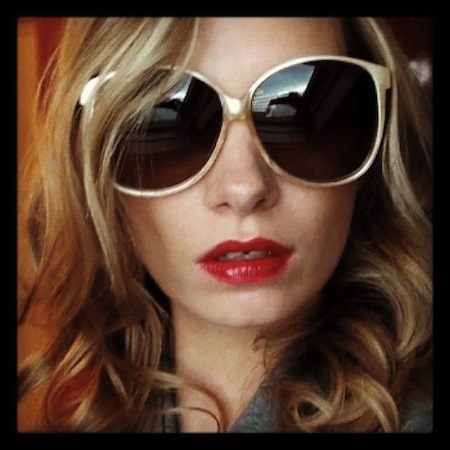 In this photograph I am wearing the utterly marvellous YSL Rouge Pur Couture Glossy Stain in shade 20 and a pair of Polaroid Donna sunglasses. For some reason I feel a LOT braver with my lip colour choices when I’m hiding my eyes behind a pair of sunglasses – I think that usually I feel as though my eyes ‘disappear’ when I’m wearing bright lipstick, so this is the perfect solution! The YSL Glossy Stain is brilliant – amazing staying power and the strangest, lightest texture! You have to apply two or three coats to get the very best wear, but once it’s on, it’s ON. It’s almost like car paint for the face! There are a few different bright red shades – if you prefer a pinker undertone then shade 10 is the red for you. and the sunglasses are £79 from Polaroid.co.uk! Previous Post Outfit of the Day: Paris Tuxedo Leggings! Next Post No Room at the Inn.